Tipico is a gambling provider and bookmaker based in Saint Julian’s, Malta. The organisation operates internationally nowadays and provided sports betting opportunities to various countries around Europe. The managing director aka CEO of the bookmaker, Jan Bolz is known as a great mind and leader with vision. Tipico is quite popular in many countries worldwide, such as Austria, Gibraltar, Germany, Austria and Colombia. Players from the USA are forbidden to use the platform. Originally, there were two companies associated with Tipico, and both of them are founded in 2004. Tipico Co. Ltd and Tipico Casino Ltd were registered in MFSA (Malta Financial Services Authority) as international trading companies. And until this day more than 5000 employees are working with the online betting giant. This online bookmaker has well-developed franchise network as well. There are about 750 branches of the company only in Germany and over 1 000 around Europe, which makes Tipico a serious gambling provider in the industry. The sports betting activities of this bookie are completely separated from its other offering – casino gaming. The sports entertainment branch is under a registration number C 34286 and the casino operations are handled by a company under number C 40324. Both divisions of Tipico are financially stable and reliable choices for any player. Tipico offers a good sportsbook for the most popular sports included. There are about 15 markets in total available to every client of this traditional bookmaker. Of course, there is an additional market open for gamblers, and this is the entertainment offering. All these exciting offers are presented for both mobile and desktop users with the option for live betting included in every version of the platform. Unfortunately, live streaming is not part of the services at the moment, and Tipico hasn’t announced anything about such feature shortly. However, the bookie is still a great option for recreational gamblers who like to wager actively on football and other famous sports. 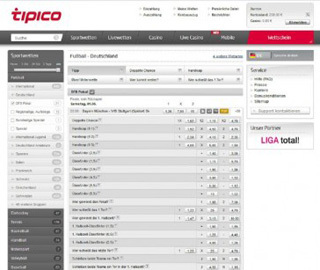 Tipico is well focused on the specific sports rather than a large offering. One of the finest benefits with the online bookmaker is their extremely fast web platform. There is almost no delay or lagging, and the website is constantly updated for better usability and performance. Small games, casino and live casino are also offered. The bookie offers great tournaments, jackpots and slot games for everyone who want to experience real casino thrills. Poker and video poker are offered. For those who know little about the games, there is special casino school where all the rules and basics of the games are explained. The odds provided by Tipico are great compared to many other European bookies. The betting company follows EU standard for odds format and employs an overall betting margin of 6.6%. Of course, there is a minimum bet of €1 for every sport. The interesting thing is that Tipico does not set a limit on the bets. However, the winnings are strictly limited to €100 000 per single bet and €100 000 per week. The limit is relatively low compared to other bookmakers. Another helpful feature is the betting history provided for every client’s account. The football betting experience at Tipico is surely worth it. The company is dedicated to providing a great coverage of most events. Players will be able to enjoy various leagues and championships from around the world. And talking about bets, we can’t miss the options available for those who like to bet on football in various combinations. Type of wagers is divided in a Single bet, Combination and System. Football betting enthusiasts are free to play a standard 1X2, Double Chance, Handicap or Over/Under. Tipico uses a secure connection to its website by employing SSL encryption on all the data passing through. The security protocol is certified by Verizon Enterprise Solutions and ensure a well protected and secure transition of any sensitive data. Every client has his details and private information safely stored. Tipico is also a charter member of VEWU or Association of European Betting Enterprises. With the high-security standards, we can expect nothing less from Tipico’s customer care services. The department is highly respondent to all kind of issues and questions, however, they are missing an instant contact method – a phone line. The support representatives can be reached only via email. The service hours are every day from 8 AM to 11 PM CET. Live chat is not supported as well. There is a wide selection of payment methods presented for international clients. However, the online bookie supports just one currency, and this is the Euro as you can see in the table. Naturally, the most common and popular pay services are available and all of them can be seen in the table. There are usually no fees for payments, except for some special occasions when the customer exceeds certain limits. Deposits and withdraws have a minimum of €1 and €25 for bank transfers. Almost all transactions are instant apart from the bank transfer, which usually takes from 3 to 7 business days. An exciting, welcoming bonus awaits the new player who joins Tipico. The promotion is a deposit bonus, which is 100% of the investment. The minimum and maximum amounts are €10 and €100 respectively. In other words, if you deposit €100, you will get them doubled in a total of €200. Of course, there are certain requirements for the bonus. It’s only available to residents of Austria, The Netherlands, Germany, Sweden, Denmark and Belgium. Rollover is set to 3x and the minimum odds are 2.0. There is a great surprise for the dedicated gamblers who play in Tipico. 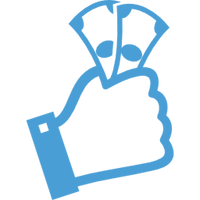 The Combi bonus system, which benefit existing players by giving them up to 25% in addition to the winnings. The bonus depends upon the length of the combination bet. Strategists can take advantage of the offering and have their schemes and tactics win additional cash.